Just a heads-up regarding the 'Eukaryome' conference in Paris later this year... looks interesting! A 100% prevalence of Blastocystis in a cohort of 93 Senegalese children! The children represented a mixed group of children with and without symptoms. And yes, they were all colonised! 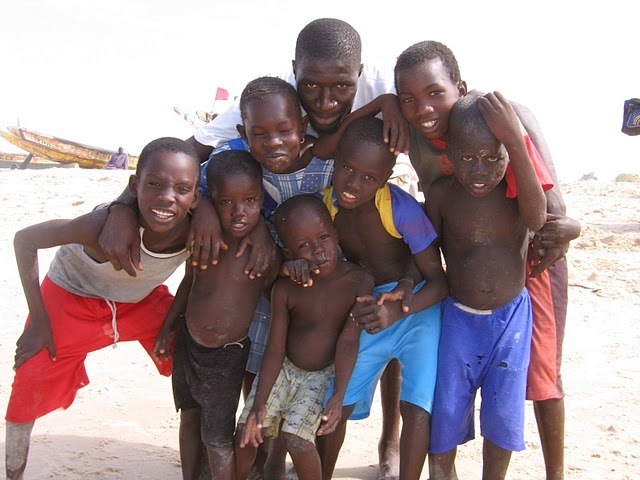 Are Senegalese children obligate carriers of Blastocystis? Image courtesy of whl.travel. I will not at all try and discuss the potential clinical implications of this. I don't think we currently have the appropriate tools to ascertain to which extent a 100% Blastocystis prevalence is a public health problem. However, technically and scientifically, I'm extremely pleased to see a study like this one. My group and some of my colleagues have somewhat similar data in the pipeline, and it's great to see this next generation of survey data emerging from different regions of the world, based on the use of highly sensitive molecular tools to screen for Blastocystis. I cannot emphasise the importance of this too much. The authors hoovered faecal samples from the children for Blastocystis-specific DNA using both PCR + sequencing (barcode region) and real-time PCR. Importantly, quite a few samples negative by barcoding were positive by real-time PCR, and so if the authors had included only PCR + sequencing, the prevalence would have been only 75% or so. It may be not very surprising that barcoding PCR did not pick up all cases of Blastocystis, but then again, it has always been known that the barcoding PCR is not diagnostic - one of the primers, RD5, is a general eukaryotic primer, while the other one, BhRDr is Blastocystis-specific. Also, the PCR product is about 600 bp; diagnostic PCRs should preferably be designed to produced much smaller amplicons (100 bp or so) for a variety of reasons. The research team subtyped all samples, and found ST3 to be the most prevalent subtype - colonising about 50% of the children. ST1 and ST2 were also common, while ST4 was found in only 2 children and only in mixed infections. Mixed subtype infections was seen in 8 cases. Note the small fraction of ST4. This subtype is very common in Europe but seems to be rare in most other regions. There is no doubt that we with molecular tools are now starting to obtain data that represent a more precise snapshot of reality than before when tools of low sensitivity and unable to give strain information were used. And while qPCR can take us a long way in terms of precisely distinguishing positive from negative samples, we still have an amplification step that may interfere with the DNA information that we obtain. The French group involved in this study has over multiple studies done an admirable job in terms of pursuing the extent of mixed subtype infections. Whether the data are based on sequencing of PCR products amplified by genus-specific primers, or whether real-time PCR using genus-specific primers is used, it can still be argued that these methods have limitations due to application of genus-specific primers in both cases. It is going to be interesting to compare the evidence that we have collected from subtyping over the past few years with analysis of metagenomics data, which are independent of PCR amplification, and thus not subject to potential bias. A 100% prevalence means that transmission pressure is massive. Three subtypes are common. Still, mixed infections are present in less than 10%. If this is indeed a realistic picture, this may imply that once established, a Blastocystis strain is capable of keeping other strains at bay? In keeping with waht I said above, it is also possible that the extent of mixed infections is higher, and that the PCR methods only detect the more predominant strain, making the prevalence of mixed ST infection seem low. It's tempting to believe that such a high prevalence of Blastocystis compared to Europe is due to exposure to contaminated water, but how does this explain a whopping 30% Blastocystis prevalence in the background population in Denmark, a country characterised by supreme hygienic standards and 'perfect plumbing' with all potable water being pumped up from the ground (ie. hardly no surface water)? Have all individuals positive for Blastocystis in Denmark been out traveling to more exotic countries with less well controlled water infrastructures? Or is Blastocystis just highly transmissible through e.g. direct contact? And will all who are exposed develop colonisation? What are the determinants? It's probably not fair to dismiss the idea of Blastocystis being waterborne (as one of the modes of transmission) due to the fact that Blastocystis has not been cause of waterborne outbreaks. If Blastocystis is non-pathogenic, it can easily be transmitted by water. In fact, if Blastocystis is waterborne and never gives rise to outbreaks, what does this tell us about it's pathogenic potential? Well, acute disease such as that seen for some bacteria, viruses, and Cryptosporidium, Giardia and microsporidia is probably not something that is associated with the organism. I could have wished for allele analysis of the subtypes detected. It should be possible in all cases where barcode sequences were available, - simply and easy using this online tool. But the data is available in GenBank so everyone interested can have a look. There is plenty of interesting things to address, but for now I'll leave it here, and on behalf of all of us interested in Blastocystis research just thank the people behind the paper for publishing this important study! And nope, this is no April Fool! 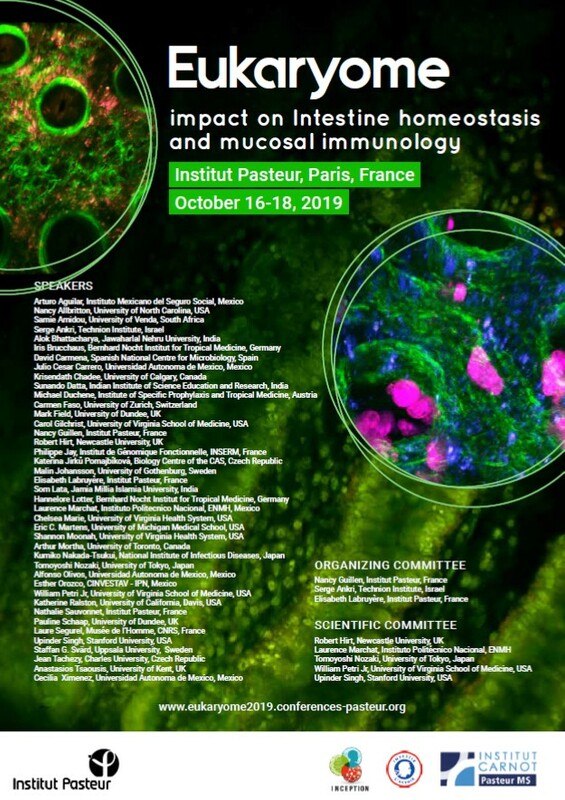 My colleagues from Statens Serum Institut and I are heading to Lisbon, Portugal, tomorrow morning to attend the Cell Symposium on Microbiome and Host Health (link may be really busy now). We are bringing a poster displaying some of our work related to our GUT18S project: A Novel Approach For Eukaryotic Phylogenetic Interrogation Of Clinical Samples Using Next Generation Sequencing Of SSU rRNA Genes; a pdf version of the poster can be downloaded here. The GUT18S work is partly funded by the Marie Curie Actions (FP7) program. My recent post Blastocystis aux Enfers was my "literary take" on biological adaptation of intestinal parasitic protists, using Blastocystis as an example. As a parasitologist you'd come across many peculiar and shrewd biological adaptations and life cycles, and I hope to be able to give some examples in a future post. Actually, there is a parasite which is quite common in humans, maybe even just as common as Blastocystis, which is also single-celled, but which may have a much more complicated life cycle than Blastocystis, namely Dientamoeba fragilis; a colleague of mine is currently doing his PhD on Dientamoeba and he has collected multiple sources of evidence to confirm the hypothesis that this parasite is transmitted by a vector, namely pinworm, probably along the same way that Histomonas meleagridis – the cause of blackhead disease in especially turkeys – is transmitted by heterakids (which again are transmitted by parathenic hosts such as earthworms, which get eaten by turkeys, chickens, etc.). Anyway, I’ll probably get back to Dientamoeba, once his data are out. Meanwhile, Blastocystis comes out of a very heterogeneous group of organisms called Stramenopiles, many of which are algae. Algae are photosynthetic organisms found in habitats as diverse as glacial ice and hot springs.One of these algae is named Galdieria sulphuraria, which is a remarkable unicellular eukaryote inhabiting hostile environments such as volcanic hot sulfur springs where it is responsible for about 90% of the biomass; indeed this certainly qualifies as "Galdieria aux enfers"! We were lucky enough to have a paper accepted for publication in the ISME Journal (Nature Publishing Group) in which we call for data on the "human intestinal eukaryotome". "Recent developments in Next Generation Sequencing (NGS) technologies have allowed culture-independent and deep molecular analysis of the microbial diversity in faecal samples, and have provided new insights into the bacterial composition of the distal gut microbiota. Studies of the microbiome in different patient groups using metagenomics or 16S rRNA gene sequencing are increasing our knowledge of how the microbiota influences health and disease. The majority of recent advances in our understanding of human microbiota structure and dynamic changes in disease were made through phylogenetic interrogation of small subunit (SSU) rRNA (Paliy and Agans 2012). However, until recently such studies have generally failed to include data on common eukaryotic, endobiotic organisms such as single-celled parasites and yeasts ('micro-eukaryotes'). This deficiency may strongly bias the interpretation of results and ignoring an entire kingdom of organisms is a major limitation of human microbiome studies." 2012 is coming to an end and it is also time for taking stock of the year Blastocystis-wise. We saw many significant scientific papers, among them a paper by Poirier and colleagues, predicting a potential role for Blastocystis in irritable bowel syndrome (IBS), based on analysis of their recent genome data.They propose that Blastocystis is genetically armed with the equipment necessary to cause intestinal dysbiosis, and potentially IBS, which may be a cause of dysbiosis. Indeed, members of this group found that the Blastocystis genome encodes various proteases and hydrolases that, if secreted, may be involved with perturbations of the gut flora; however, we need transcriptional profiling or similar studies to find out, whether these enzymes are actually expressed. Some species of Entamoeba are also in possession of multiple "virulence genes", but for some species they apparently remain un-expressed, and most Entamoeba species are still considered harmless. My Microbes - Share Your Microbiota! Meanwhile, a lot of effort is being put into collecting stool samples from the background population. There is a project called My Microbes, there's the uBiome project and the American Gut Project, just to mention some. For instance, for less than $100 you can have your entire bacterial intestinal microbiome seqeunced and identified. Maybe, you will even get to know your "enterotype"?! My.microbes from Anna Pesavento on Vimeo. It is, however, debatable whether these enterotypes are clear-cut or represent a continuum/gradient. Nevertheless, the prospects of these stupendous microbiome projects are numerous, and once we add the intestinal eukaryotic microbiome to this field and probe into the ecological interplay between eukaryotes, bacteria and the host, new pathways of knowledge will probably lead to many answers to old conundrums, but also to new questions of course. We will get a better impression not only of which bacteria that are beneficial, but also whether - or to which extent - common "scroungers" like Blastocystis are in fact benevolent along some of the lines presented in this recent blogpost. By the way: Behold the video still: All set for setting up PCR!